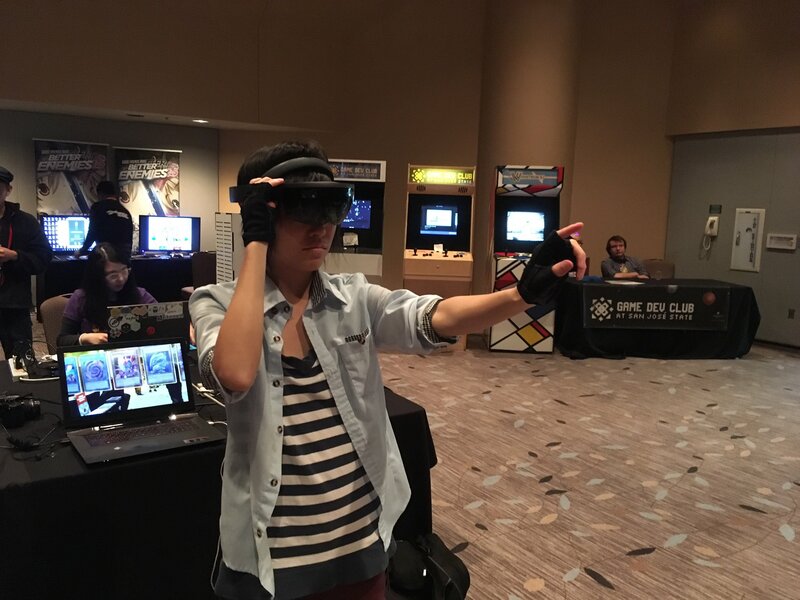 We wanted people to test Duel Monsters GO for the Microsoft HoloLens! Our team knew that we needed to have random people test the game to make sure that certain design characteristics made sense. Duel Monsters GO is a fan-based game. Yu-Gi-Oh! belongs to Kazuki Takahashi and Konami. Please support the official release. 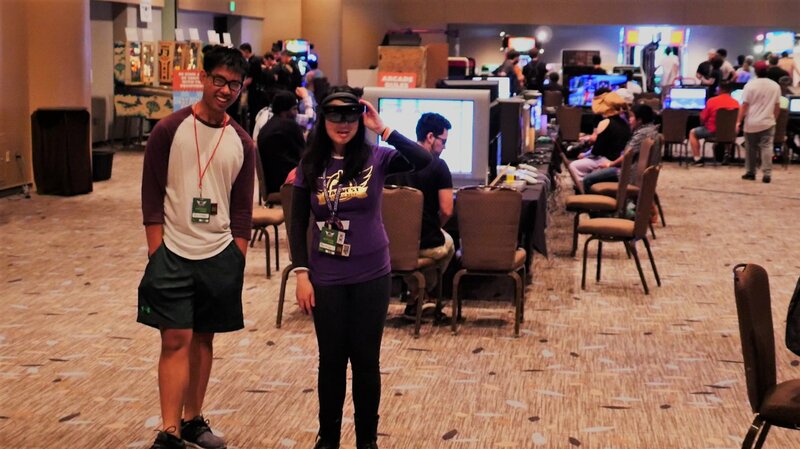 SUMMER PLAY: San Francisco Game Expo! 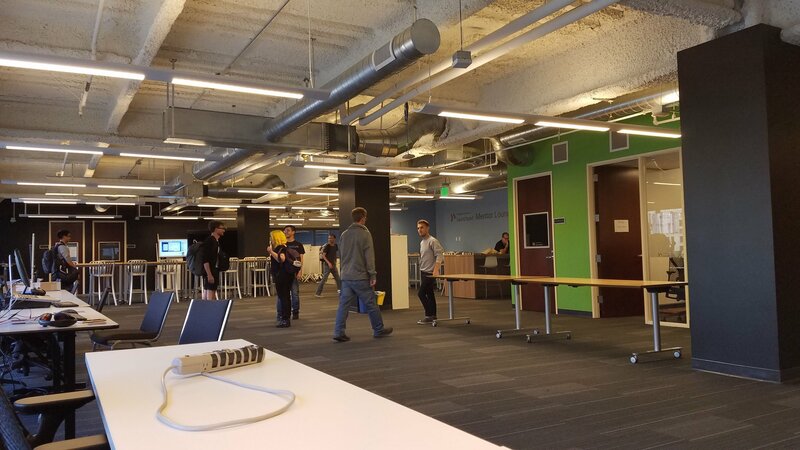 was held at The Google Launchpad, 301 Howard, 4th Floor at San Francisco, CA 94107. Thanks to Playcrafting SFO, an organization that provides indie game developers resources, we were allowed to share our game and have people test Duel Monsters GO! 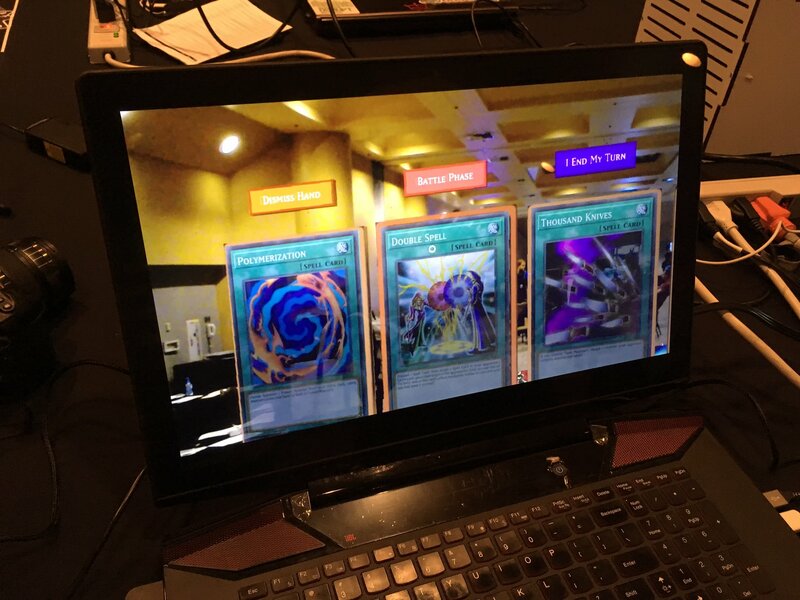 On August 23rd, 2017, we headed to the event with a couple of HoloLenses and shared with attendees Duel Monsters GO with preconfigured Yugi, Kaiba, and Joey battle city decks. We learned firsthand how many things in the game made sense to us that didn’t make sense to others. Straight off the bat, we noticed that we had a long way to go in order to make this game into something even remotely good. The HoloLens is not a device that you can pick up and instantly know how to use. The HoloLens uses a pinch gesture that is called an air tap, but it’s more like a pinch that you quickly release. Pinching with a quick release is how you click with the HoloLens. But no one knows that pinching is how you click with the HoloLens unless they’ve used one before! The general behavior that we observed is that intuitively, when you see “holograms” or these 3D objects floating in front of us, we think that we should be able to push our finger on it, and it’ll respond. No, it doesn’t work that way! You have to look at the target, pinch, and quickly release to click on it. For pinching or air tapping to work, you need to have your hand stay within the field of vision of the HoloLens’s front-facing cameras. The detection range is decent, but we noticed that many people like to keep their arm too close to their bodies. They keep their elbows bent and don’t extend their arm far enough. Duel Monsters GO doesn’t have a tutorial. We were the tutorial. 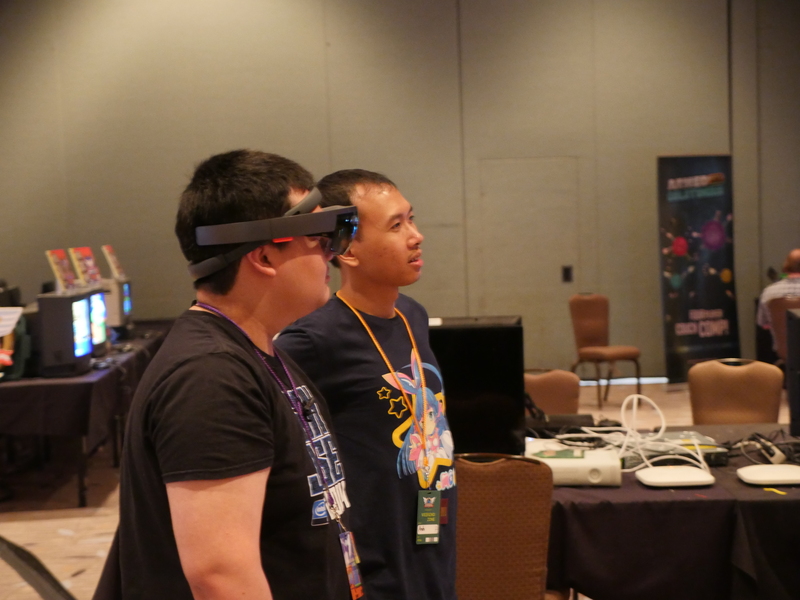 We found ourselves, teaching people how to put on a HoloLens securely with the inner headband, how to perform the clicking gesture, and where to ideally put the hand for gestures to be detected. Duel Monsters GO is hard to teach to people who have never played Yu-Gi-Oh! before. A lot of people had heard of Yu-Gi-Oh!, but they had never played Yu-Gi-Oh! before. We didn’t have a tutorial, so at least one of us was always explaining how to play Yu-Gi-Oh! and what the player should do. At the time, Duel Monsters GO was a very manual game, so people who actually knew how to play Yu-Gi-Oh! could eventually figure how to play. We learned how counterintuitive certain things were. Thanks to all the players who tested Duel Monsters GO and opened our eyes to how confusing some of the design was. We assumed that certain things made sense like some voice commands, but even people who knew a thing or two about Yu-Gi-Oh! had a hard time dueling! Voice commands did not work well since the floor was packed. People wanted to yell out voice commands like in the show, but the HoloLens offline voice recognition is only designed to detect an isolated group of words. You need to be loud, clear, and exact. At the time, we didn’t have a good way to determine phases and ending a turn. Since players were 20 feet away from each other and the floor was packed, we were using obscure hand signals to tell the other player that we had ended our turn. Duels took too long. Since the event was only for 3 hours, we figured out that we hadn’t chosen the best decks for dueling. We had to abbreviate our explanations, shorten the demo experience, and cut duels short to give time to share with the next person. We found a bunch of bugs! Players found network bugs here and there that broke the rules of Yu-Gi-Oh! 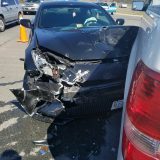 That’s why you should always have people test your game! We found that random strangers were the best way to figure out firsthand the complexities of designing a fun augmented reality game! There were bad game design characteristics and bugs here and there, but I’m glad to have learned from the issues early on! Thank you to everyone who we met at the San Francisco Game Expo 2017! Thanks to Anh, Mike, and Nico for coming with me! 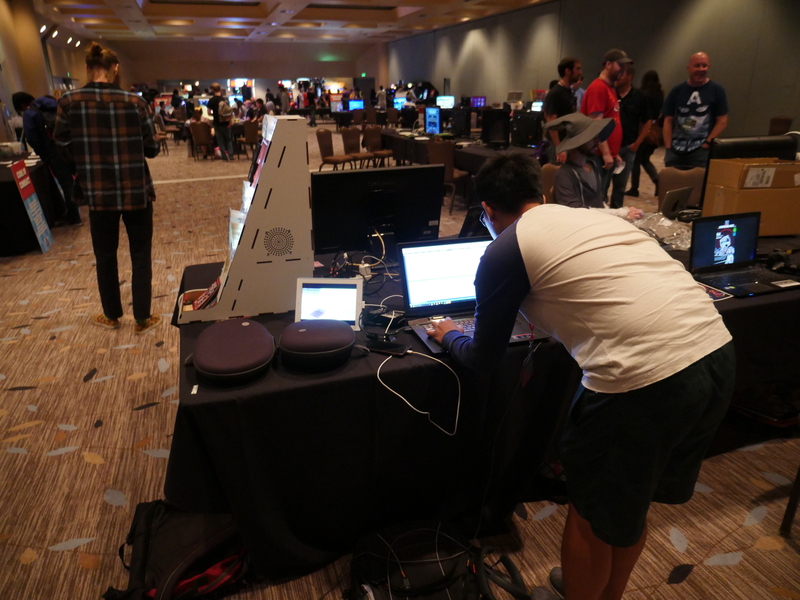 Invigorated by SF Game Expo, we had a couple of days to prepare for MAGWest and Crunchyroll Expo 2017, so I spent a lot of the time, fixing existing network bugs. 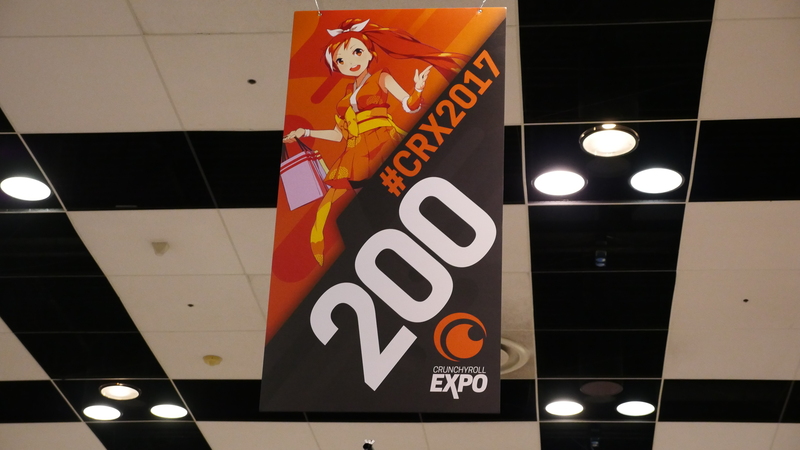 MAGWest and Crunchyroll Expo took place side-by-side that weekend on August 25-27, 2017 in the Santa Clara Hyatt and Convention Center in Santa Clara, CA. 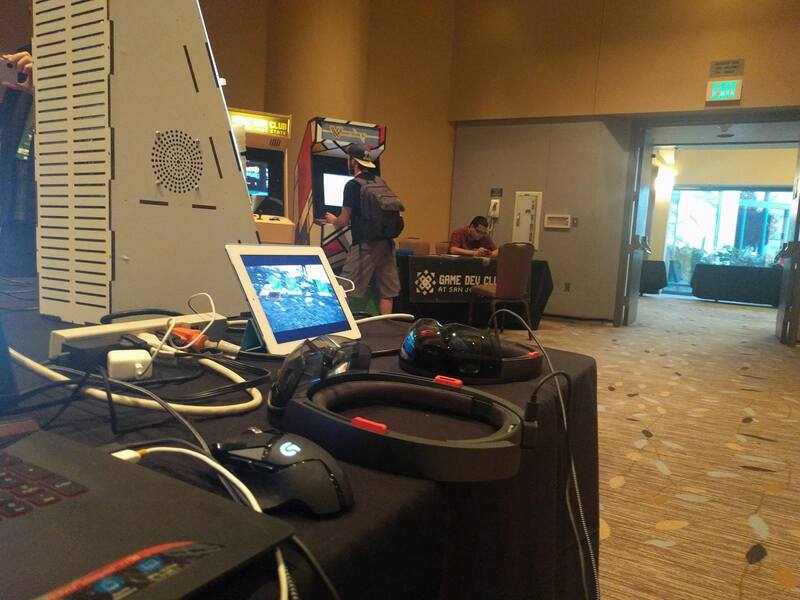 We were part of the Indie Game Showcase at MAGWest! 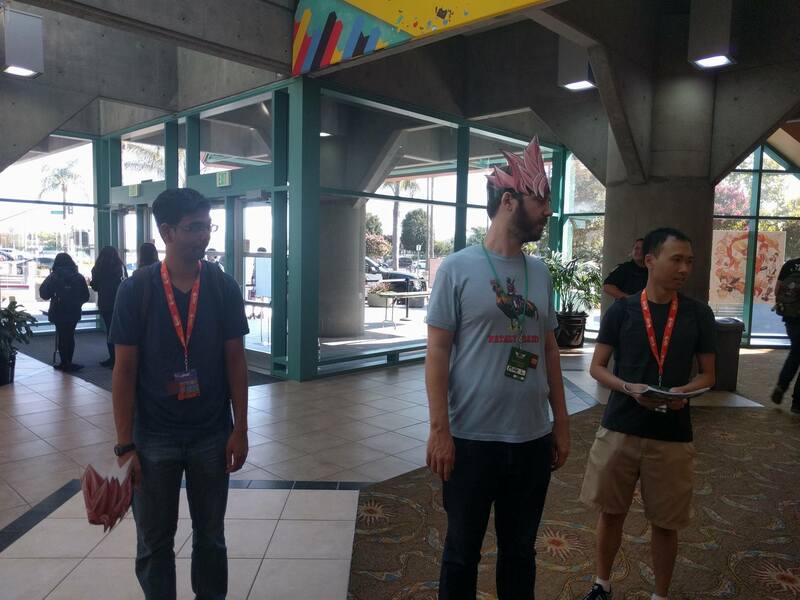 If you had a MAGWest badge, you could check out Crunchyroll Expo’s exhibit hall. If you had a Crunchyroll Expo badge, you could head over to MAGWest’s concerts and indie game showcase. 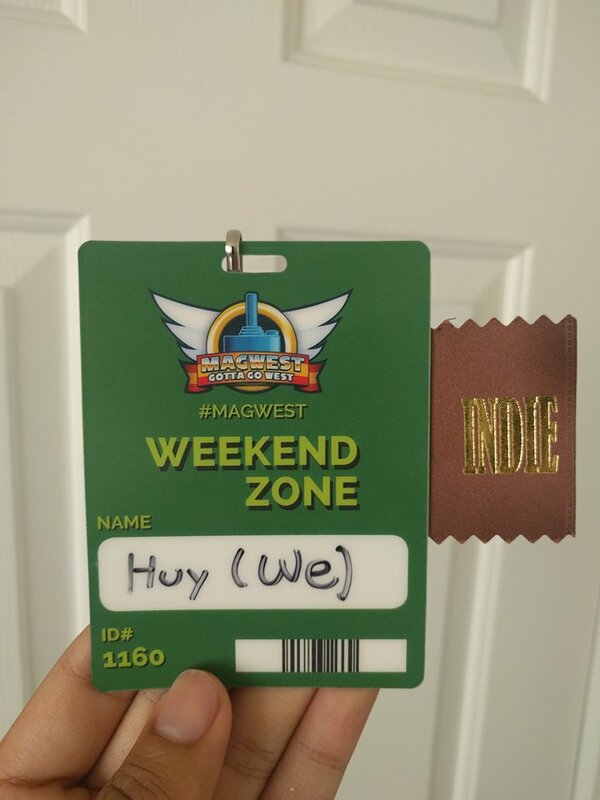 Instead of being just a 3 hour event, MAGWest was spread out into 3 days! We now had plenty of time to have complete duels and see how people played the game. 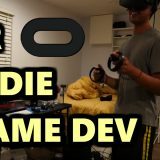 Even though the bugs that we found at San Francisco Game Expo were mainly fixed, we found that the HoloLens and the game could still be hard to teach and use. We were still plagued with some of the same issues while demoing Duel Monsters GO. Pinching was still counterintutive and needed to be explained. Voice commands didn’t work well in the loud ballroom especially if you didn’t speak the most vanilla English possible. We still had to explain to people how to play the game if they had never played Yu-Gi-Oh! before, but even if they had, some things were still not obvious. We realized that we have to make the game automatic since manual controls limit the fun to those who are already very experienced with Yu-Gi-Oh! 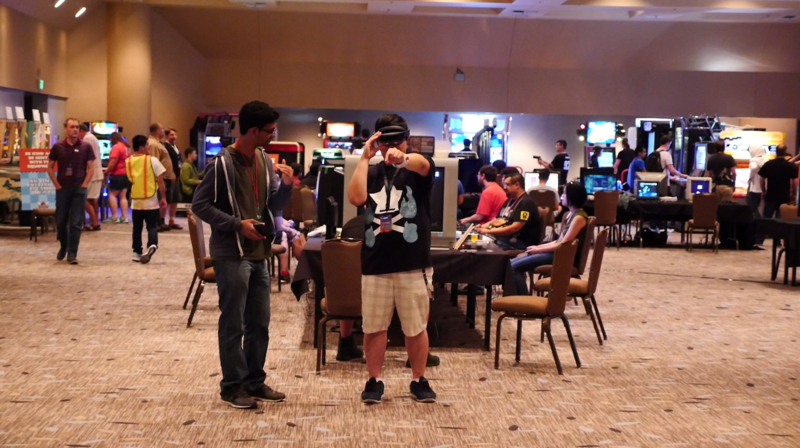 Attendees at MAGWest gave us much more detailed experiences since duels were longer, and we could really get a sense where the game was lacking. I was changing things each of the 3 days in order for us to test numerous new features. 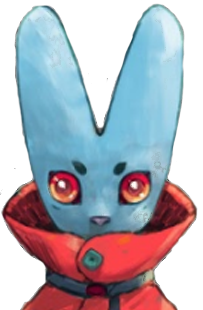 Here are some of the design problems that we encountered at MAGWest and what we ended up doing. Attacking was confusing. At the time, to attack an enemy’s monster, you had to look at your target and say, “Attack.” Since the game was still manual, the other player would have to send their monster to the graveyard if they agreed with your attack. We need context menus on cards! Can I normal summon this card? Is this trap card playable? Not everyone was a Yu-Gi-Oh! pro. We needed better cues for actions. For example, at the time, ending your turn only made a sound effect for the other player. You didn’t know that you actually ended your turn! By the second day, I had integrated phases. You could now hit buttons to change phases like Battle Phase and End Phase and notify the other player. By the third day, we had integrated Dark Magician and Red-Eyes Black Dragon structure decks that were more fun to use and faster to play. One design problem that was more obvious to us at MAGWest was that we should compensate for the HoloLens’s small field of vision (FOV). For those who have never tried the HoloLens, the FOV is only a small rectangle. We learned that we should integrate some sort of pointer whenever new actions occurred on the field or else, you’d hear a sound effect and be confused what exactly happened! We need to build around the device’s limitations and usability in order to give the best playable experience. Our number one lesson from MAGWest was that we must make the game as sensible as possible and let the game teach the user. The game can’t be fun if people can’t learn how to play it by themselves! 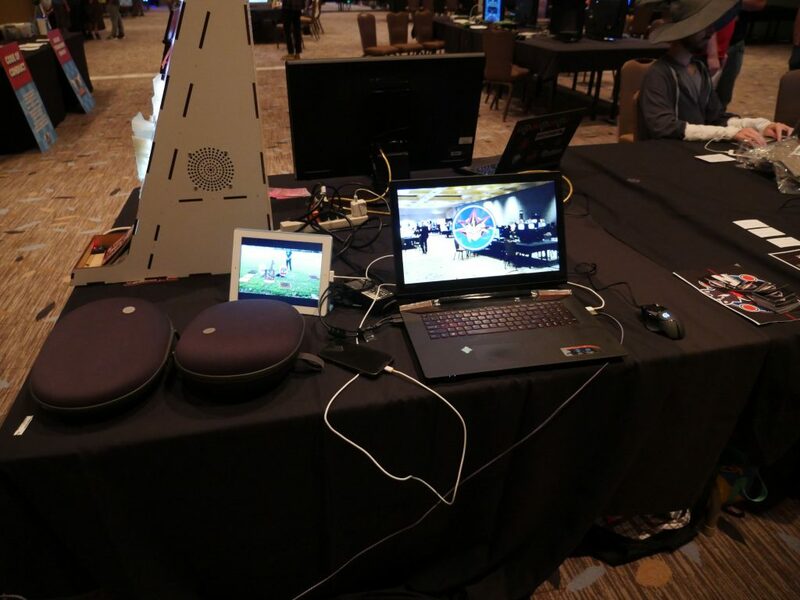 We always had a HoloLens hooked up to my laptop in order for us to see what one of the players was seeing. It was a great way to figure out the problems in the design as well as teach people how to play Duel Monster GO! We met a ton of awesome people at SF Game Expo, MAGWest, and Crunchyroll Expo 2017! Thanks for testing Duel Monsters GO and helping us make the game better! Thank you to Tushar, Anh, and Mike for coming with me to help demo Duel Monsters GO! Thank you Playcrafting SFO for informing and giving us a chance to demo! Our plan is to keep on iterating, seek crucial feedback from people who have never used the HoloLens before, and improve the game design until it makes absolute sense. We have a long way to go, but I’m glad to have let people try the game early and help us discover what works and doesn’t work! We’ll be uploading bi-weekly video updates on the MicrowaveSam YouTube channel, so subscribe and check back with the Slothparadise team periodically for news and updates. These video updates will feature character duels or news in an entertaining format with subtle displays of the most recent updates and improvements.